Welcome back to Messier Monday! Today, we continue in our tribute to our dear friend, Tammy Plotner, by looking at that “evil” customer known as Messier 64 – aka. the “Black Eye Galaxy”! One of these objects is known as Messier 64, which is also known as the “Black Eye” or “Evil Eye Galaxy”. Located in the Coma Berenices constellation, roughly 24 million light-years from Earth, this spiral galaxy is famous for the dark band of absorbing dust that lies in front of the galaxy’s bright nucleus (relative to Earth). Messier 64 is well known among amateur astronomers because it is discernible with small telescopes. 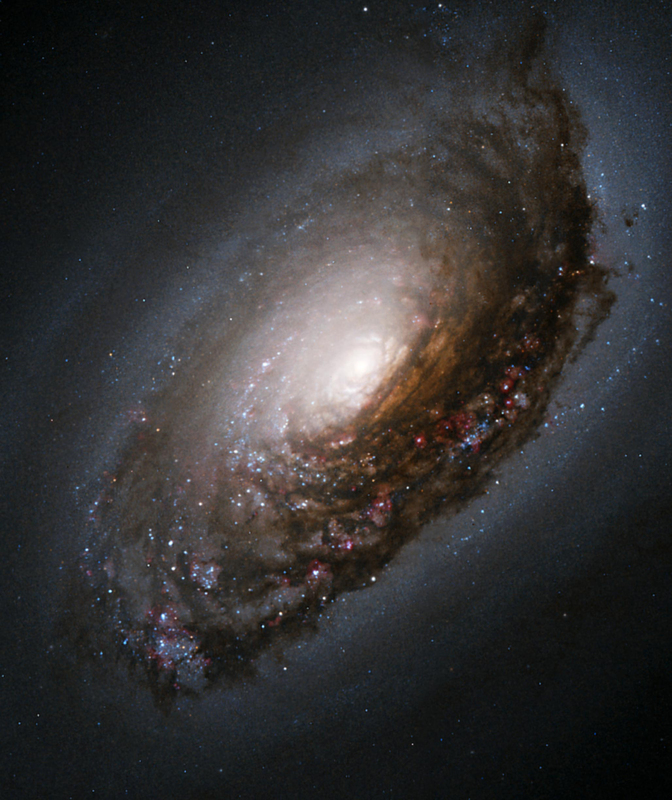 Residing about 19 million light years from our home galaxy, the “Sleeping Beauty” extends across space covering an area nearly 40,000 light years across, spinning around at a speed of 300 kilometers per second. Toward its core is a counter-rotating disc approximate 4,000 light years wide and the friction between these two may very well be the contributing factor to the huge amounts of starburst activity and distinctive dark dust lane. Stars themselves appear to be forming in two waves, first evolving outside following the density gradient where abundant interstellar matter was waiting, and then evolving slowly. As the material from the mature stars began beig pushed back by their stellar winds, supernovae, and planetary nebulae, increased amounts of interstellar matter once again compressed, beginning the process of star formation again. This “second wave” may very well be represented by the dark, obscuring dust lane we see. Messier 64 (“Black Eye Galaxy”) imaged using amateur telescope. Credit: Jeff Johnson. Locating M64 isn’t particularly easy. Begin by identifying bright orange Arcturus and the Coma Berenices star cluster (Melotte 111) about a hand span to the general west. As you relax and let your eyes dark adapt, you will see the three stars that comprise the constellation of Coma Berenices, but if you live under light polluted skies, you may need binoculars to find its faint stars. Once you have confirmed Alpha Comae, star hop approximately 4 degrees north/northwest to 35 Comae. You will find M64 around a degree to the northeast of star 35. While Messier 64 is binocular possible, it will require very dark skies for average binoculars and will only show as a very small, oval contrast change. However, in telescopes as small as 102mm, its distinctive markings can be seen on dark nights with good clarity. Don’t fight over it… There’s plenty of dark dustlane in this Sleeping Beauty to go around!